welcome to the october new release giveaway! 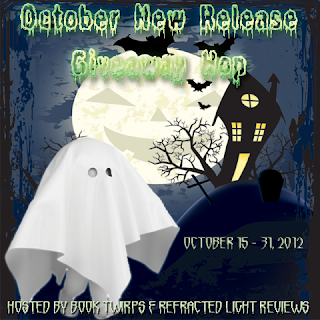 In celebration of October, I'm giving away one new October release! It must be Young Adult. Other than that, the choice is yours! Need ideas? Here's a list of some new October releases! This giveaway will run until October 31st. The irony is that any school that is aware of what effect censoring can have and still decides to go ahead with the policy will actually be doing something very admirable. That is, it will be sticking to its principles even as it knows it will be punished rather than rewarded for it. I don't believe in censorship in the schools. I believe a parent does have a responsibility to know what their kids are reading and to read books with them and/or discuss controversial topics with them. A parent should know if their child is ready to read certain material, but that doesn't give them the right to tell another parent that their child isn't ready or what their child should or should not be reading. At the same time, if a parent feels material is inappropriate for their child, that child has the right, especially by the time they are a teenager, to discuss with their parents why they should be allowed to read it, to prove that they are mature enough to handle it. I feel parents should stay informed on what type of reading material their children are bringing home from school. They have a right to determine what type of material is appropriate for their own child's maturity level. They do not however have the right to take books away from anyone else's child. Many books that have been banned/challenged often have characters and situations in them that kids can relate to. They can help educate, and open up topics of discussion. A parent should also NOT make the decision to keep a book from their child without haveing read it for themselves first. The country I live in is rather conservative so many things are always censored one way or another so I haven't really thought about it in terms of 'books' and 'schools'. But I do believe that we should be allowed to read what we want, within reason of course. I'm excited for Beautiful Redemption - thanks for the giveaway! I am super excited to read Beta because I loooove Dystopians! =) Thanks for the giveaway! I really can't wait for Beta!! I'd love a copy of THE EVOLUTION OF MARA DYER! I have the first in the series and would love to add the next one to my collection. Thanks for the giveaway! I'm looking forward to Finale! I'm excited for The Assassin's Curse by Cassandra Rose Clarke. I'm looking forward to Gravity, The Assassin's Curse and Breathe. I'm obsessed with Eve and Adam & Crewel! I've read so many good things about them! I can't wait to read them. I'm looking forward to Ironskin because I love a good fantasy! The Evolution of Mara Dyer. iam excited to aobsidiant,,coz i love the cover, and my friend tell me,,obsidian a good books.. I can't wait to read Gravity by Melissa West, because it has aliens and romance! So many new books this October. The ones I most look forward to are Death and the Girl Next Door, Assassin's Curse, Breathe, Dark Star. I'm looking forward to Ashen Winter because I just recently read Ashfall..I have to find out what happens next! I can't wait for Dark Star, I'm a huge fan of comicbooks and superheroes and after reading some early reviews of the book I can't wait for it!! Looking forward to Iced by Karen Marie Moning! I'm looking forward to Crewel and Gravity. There are so many titles I can't wait to read this month! Beautiful Redemption, The Evolution of Mara Dyer, Finale, Mystic City, Velveteen - I could go on and on! I can't wait for Crewel and Velveteen and Finale and Beautiful Redemption and The Evolution of Mara Dyer and Mystic City, The Assassin's Curse, Dark Star, and so many more. And I am looking forward to the first in the series, because they sound amazing, and I am looking forward to the series books because I loved the other books in the series! Thanks so much for the chance to win! I am excited for The Evolution of Mara Dyer because the first book was amazing! I've been waiting for what seems like forever for the next book so I'm thrilled that it is almost time to be released :) Thank you! I'm looking forward to Poison Princess! I love Kresley Cole and I am excited to see what she's written for YA readers! Looking forward to The Spindlers because I love Lauren Oliver and am excited to see her write MG! I can't wait for Iced by Karen Marie Moning. I've been waiting this book forever. I love her fever series and was so happy that there will be a spin-off. Phantom Shadows by Dianne Duvall, i wait this series from book #1. I am looking forward to Poison Princess, I have heard amazing things about Kresley Cole's adult series. Thanks so much for the giveaway! Eve and Adam, Crewel, Finale so many more to name. I can't wait to read The Evolution of Mara Dyer, because I loved the first book in the series. I'm excited for Poison Princess and Valkyrie Rising. Crewel, Poison Princess and Valkyrie Rising! Eve and Adam because I am a huge Michael Grant fan! I want The Crimson Crown SO bad. One of my most anticipated books of the year. Thanks for the giveaway! I cant wait for Ices. Love the Fever series. I'm waiting for Finale, Poison Princess and Adam and Eve. Wow, I've never heard of this series but you caught me at "epic fantasy." I'm going to explore this! Evolution of Mara Dyer because of that cliffhanger at the end of Unbecoming! Crewel, Velveteen, Poison Princess and The Crimson Crown. I can't wait Poison Princess, Mystic City... there's so many more that I want but can't think of off the top of my head! There are lots! Crewel, Mystic City, The Lost Prince, and many more. I think these books are really interesting. Plus, I've heard lots of good things about them. Blind Spot by Laura Ellen. I can't wait to read Finale by Becca Fitzpatrick because it is the last book and want to know how it ends! Thank you for the great giveaway! I'm excited for Valkyrie Rising! Iced by Karen Marie Moning because I have read her other books and I loved the Fever Series! Thanks for the great giveaway! The Shattered Dark by Sandy Williams. Thanks for the giveaway! Definitely The Evolution of Mara Dyer, I have been waiting to read The Evolution of Mara Dyer until this book is released so I can read them back-to-back. I can't wait to read Death and the girl next door by Darynda Jones. I love her books. Thanks for this great giveaway! I'm excited for Mystic City, Eve and Adam, and Crewel. Thanks! Venom by Fiona Paul cause I really want to read it! Lover Reborn by J R Ward. I love the BDB series. I really looking forward to Mystic City, Velveteen and The Torn Wing. Thanks for the chance! I am looking forward to the Evolution of Mara Dyer, because I am DYING to see what happens next! The first book in the series was so good! !